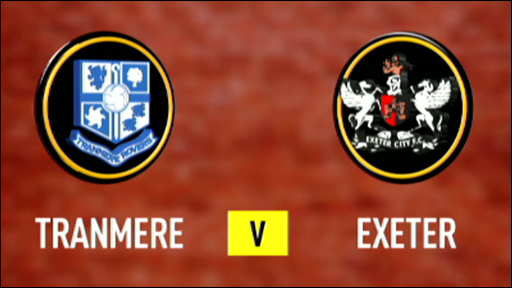 Tranmere boosted their survival hopes with victory over 10-man Exeter in what was a relegation six-pointer. The Grecians lost a man when James Dunne was dismissed for a second bookable offence after fouling Joss Labadie in the first half. Craig Curran headed Tranmere ahead before Labadie fired in from 30 yards to double the advantage. Stuart Fleetwood pulled one back for Exeter before Gareth Edds slotted in from a corner to seal the win. "We've made enough chances to win a couple of games. "It was one of those games you dominate the game and you lose something at the end, so it was a relief to get the third goal. "It is a relief because it would have dragged us down if we had been beaten." "We have to now concentrate on what our job is to do over the next few weeks and prepare for those games, because today's gone now and we have to move onto the next game. "I have to be very careful that we don't wallow in this afternoon's result and we have to be very clear on what we have to do over the next few weeks." 90:00+3:27 The final whistle goes and the game is over. 90:00+1:21 Shot from outside the box by Liam Sercombe misses to the left of the goal. 90:00+0:29 Free kick awarded for a foul by Craig Curran on Liam Sercombe. Free kick taken by Paul Jones. 89:50 Short corner taken by Gareth Edds from the left by-line. 89:38 Ian Thomas-Moore takes a shot. Paul Jones makes a save. 89:02 Stuart Fleetwood sends in a cross, clearance by Ash Taylor. 87:35 The assist for the goal came from Kithson Bain. 87:35 GOAL - Gareth Edds:Tranmere 3 - 1 Exeter Gareth Edds finds the net with a goal from just outside the penalty box to the bottom left corner of the goal. Tranmere 3-1 Exeter. 87:03 The ball is swung over by Stuart Fleetwood, Ian Goodison makes a clearance. 86:45 Corner taken by Ryan Harley from the right by-line. 86:34 The ball is swung over by Scott Golbourne, Zoumana Bakayogo manages to make a clearance. 85:17 Gareth Edds takes the outswinging corner, clearance made by Scott Golbourne. 84:42 Corner taken right-footed by Gareth Edds from the right by-line to the near post, Barry Corr manages to make a clearance. 84:03 The assist for the goal came from Scott Golbourne. 84:03 GOAL - Stuart Fleetwood:Tranmere 2 - 1 Exeter Stuart Fleetwood grabs a goal from close in to the bottom left corner of the goal. Tranmere 2-1 Exeter. 83:17 Unfair challenge on Matthew Taylor by Kithson Bain results in a free kick. Free kick taken by Ryan Harley. 82:59 Barry Corr crosses the ball, Joss Labadie makes a clearance. 81:21 Long range shot from Liam Sercombe misses to the left of the goal. 80:51 The ball is swung over by Scott Golbourne, clearance made by Zoumana Bakayogo. 79:38 Marlon Broomes delivers the ball, Liam Sercombe makes a clearance. 79:00 Stuart Fleetwood produces a cross, Zoumana Bakayogo makes a clearance. 78:29 Kithson Bain takes a shot. Matthew Taylor gets a block in. 77:12 Unfair challenge on Craig Curran by Bertrand Cozic results in a free kick. Direct free kick taken by John Welsh. 75:25 Ian Goodison takes the free kick. 75:25 Substitution (Tranmere) makes a substitution, with Kithson Bain coming on for Bas Savage. 75:25 Bertrand Cozic concedes a free kick for a foul on Craig Curran. 75:07 The ball is crossed by Ryan Harley, Zoumana Bakayogo makes a clearance. 73:43 The ball is delivered by Scott Golbourne. 72:50 Substitution Stuart Fleetwood replaces Steve Tully. 71:38 Ryan Taylor is adjudged to have handled the ball. Free kick taken by Peter Gulacsi. 70:50 Ian Thomas-Moore takes a shot. 70:10 Liam Sercombe takes a shot. Save by Peter Gulacsi. 69:42 Craig Curran delivers the ball, save by Paul Jones. 68:32 The ball is crossed by Zoumana Bakayogo, Scott Golbourne manages to make a clearance. 68:17 The ball is swung over by Bertrand Cozic, clearance made by Ash Taylor. 67:43 Ian Thomas-Moore gives away a free kick for an unfair challenge on Matthew Taylor. Steve Tully restarts play with the free kick. 67:32 Scott Golbourne crosses the ball, Zoumana Bakayogo manages to make a clearance. 65:33 Free kick awarded for an unfair challenge on Ian Thomas-Moore by Scott Golbourne. Direct free kick taken by Marlon Broomes. 65:12 Corner taken short by Gareth Edds. 64:54 Corner taken short by Gareth Edds. 64:32 Ian Thomas-Moore sends in a cross, Craig Curran takes a shot. Blocked by Liam Sercombe. 64:01 Unfair challenge on Matthew Taylor by Ian Thomas-Moore results in a free kick. Matthew Taylor takes the free kick. 63:33 Barry Corr is caught offside. Peter Gulacsi takes the indirect free kick. 63:08 The ball is crossed by Bas Savage, Craig Curran takes a shot. Save made by Paul Jones. 60:16 The ball is delivered by Marlon Broomes, Ash Taylor takes a shot. Paul Jones makes a save. 59:56 Liam Sercombe challenges John Welsh unfairly and gives away a free kick. Gareth Edds takes the direct free kick. 59:29 Substitution Bertrand Cozic joins the action as a substitute, replacing Richard Duffy. 59:18 Booking Booking for Joss Labadie. 58:31 GOAL - Joss Labadie:Tranmere 2 - 0 Exeter Joss Labadie grabs a goal from long range to the bottom right corner of the goal. Tranmere 2-0 Exeter. 57:40 The ball is swung over by Ian Thomas-Moore, Gareth Edds takes a shot. Save by Paul Jones. 56:56 Centre by Zoumana Bakayogo, Bas Savage challenges George Friend unfairly and gives away a free kick. Free kick taken by Paul Jones. 56:12 Craig Curran takes a shot. 55:32 The ball is sent over by Zoumana Bakayogo. 54:58 Free kick awarded for an unfair challenge on Ryan Harley by John Welsh. Free kick taken by Ryan Harley. 53:20 Zoumana Bakayogo delivers the ball. 51:45 Substitution Paul McLaren leaves the field to be replaced by Gareth Edds. 50:52 Ian Thomas-Moore produces a left-footed shot from the edge of the box and misses to the right of the goal. 50:28 George Friend challenges Bas Savage unfairly and gives away a free kick. John Welsh restarts play with the free kick. 48:06 Unfair challenge on Ryan Taylor by Marlon Broomes results in a free kick. Free kick taken by Ryan Harley. 47:50 Bas Savage has a headed effort at goal from deep inside the area missing to the right of the goal. 47:10 The ball is crossed by Scott Golbourne, Barry Corr takes a shot. Save made by Peter Gulacsi. 46:34 Centre by Scott Golbourne. 45:27 Inswinging corner taken by Paul McLaren from the left by-line, Ash Taylor takes a shot. Save by Paul Jones. 45:00+3:36 The ref blows to end the first period. 45:00+1:27 Outswinging corner taken from the right by-line by John Welsh, Header on goal by Ash Taylor from inside the box goes harmlessly over the target. 45:00+1:19 Craig Curran crosses the ball, clearance by George Friend. Correction - 44:29 Substitution (Exeter) makes a substitution, with Ryan Taylor coming on for Marcus Stewart. 44:29 Substitution Ryan Taylor joins the action as a substitute, replacing Marcus Stewart. 43:45 Joss Labadie gives away a free kick for an unfair challenge on Marcus Stewart. Ryan Harley takes the free kick. 42:34 Zoumana Bakayogo provided the assist for the goal. 42:34 GOAL - Craig Curran:Tranmere 1 - 0 Exeter Craig Curran scores a headed goal from inside the penalty box. Tranmere 1-0 Exeter. 42:15 Centre by Craig Curran. 40:36 Centre by Marlon Broomes. 39:45 Paul McLaren fouled by Marcus Stewart, the ref awards a free kick. Ian Goodison takes the direct free kick. 39:33 Booking Ian Goodison receives a caution. 38:09 A cross is delivered by Zoumana Bakayogo. 35:46 Paul McLaren takes the direct free kick. 35:46 Sent off James Dunne sent from the field by the ref for second bookable offence. 35:08 Free kick awarded for a foul by James Dunne on Joss Labadie. 33:19 Inswinging corner taken right-footed by Paul McLaren, clearance made by George Friend. 32:38 Peter Gulacsi restarts play with the free kick. 32:38 Booking James Dunne receives a yellow card. 31:58 James Dunne challenges Joss Labadie unfairly and gives away a free kick. 31:48 Centre by Scott Golbourne, Ash Taylor manages to make a clearance. 29:51 Ian Goodison takes a shot. Matthew Taylor gets a block in. 28:56 Free kick awarded for an unfair challenge on Richard Duffy by Bas Savage. Paul Jones takes the direct free kick. 27:52 Steve Tully produces a cross, Effort from the edge of the box by Scott Golbourne goes wide of the right-hand upright. 26:38 Zoumana Bakayogo crosses the ball. 26:06 Paul McLaren takes a short corner, The ball is sent over by Zoumana Bakayogo, Barry Corr manages to make a clearance. 25:19 Barry Corr concedes a free kick for a foul on Joss Labadie. Direct free kick taken by Ash Taylor. 24:48 A cross is delivered by Zoumana Bakayogo. 23:44 A cross is delivered by Steve Tully, clearance made by Joss Labadie. 23:17 Foul by John Welsh on Scott Golbourne, free kick awarded. Ryan Harley takes the free kick. 22:48 Unfair challenge on Steve Tully by John Welsh results in a free kick. Ryan Harley takes the free kick. 20:48 Zoumana Bakayogo delivers the ball, John Welsh takes a shot. Paul Jones makes a save. 20:14 Marcus Stewart is flagged offside by the assistant referee. Peter Gulacsi takes the free kick. 17:26 Marcus Stewart is flagged offside by the assistant referee. Peter Gulacsi restarts play with the free kick. 16:32 Corner taken by Paul McLaren, John Welsh has a headed effort at goal from just inside the box that misses to the right of the goal. 16:25 The ball is crossed by Ian Thomas-Moore, blocked by George Friend. 16:10 James Dunne takes a shot. Ian Goodison gets a block in. 13:55 The offside flag is raised against James Dunne. Peter Gulacsi takes the indirect free kick. 13:21 The ball is swung over by Marlon Broomes, Matthew Taylor manages to make a clearance. 12:41 John Welsh concedes a free kick for a foul on Ryan Harley. Ryan Harley restarts play with the free kick. 12:30 Bas Savage produces a cross, clearance made by Steve Tully. 10:27 Unfair challenge on John Welsh by James Dunne results in a free kick. Ash Taylor takes the direct free kick. 9:22 Bas Savage gives away a free kick for an unfair challenge on Steve Tully. Richard Duffy restarts play with the free kick. 8:36 Craig Curran delivers the ball, Joss Labadie takes a shot. Save by Paul Jones. 8:08 Barry Corr takes a shot. Save by Peter Gulacsi. 7:18 Liam Sercombe sends in a cross, Marlon Broomes makes a clearance. 6:26 Free kick awarded for a foul by Bas Savage on Scott Golbourne. George Friend takes the direct free kick. 5:31 The ball is sent over by Marlon Broomes, Header from deep inside the area by Bas Savage goes over the bar. 3:59 Outswinging corner taken from the right by-line by Paul McLaren, Ash Taylor produces a header from inside the area that goes over the crossbar. 3:48 The ball is delivered by John Welsh, clearance made by Richard Duffy. 1:37 Centre by Liam Sercombe, Joss Labadie manages to make a clearance.